Everything from the most intimate whispers to booming military commands come through loud and crystal-clear.You'll get lost in the action, instead of asking other people in the room what the characters just said! Prepare to be transported into movies and music. The VP160 Mini, is available in two versions: Standard Power and High Power. 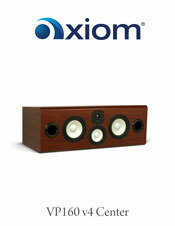 The High Power version utilizes our new heavy duty 6.5" woofer for much greater maximum SPL capabilities in the bass. The High Power version would be recommended if you are using a center channel crossover point below 80Hz in a large room and/or with large amp power. The VP160 Mini is the best center channel speaker for our award-winning M60 floor standing speakers, LFR660 Omnidirectional speakers, or M5HP speakers but will blend seamlessly with any Axiom model in the front. Designed to place dialog right in the center of the action, the VP160 center channel features the same 6.5-inch woofers, 5.25-inch midrange, and 1-inch titanium tweeter as the floorstanding speaker, to present a seamless soundstage across your screen. The result? Everything from the most intimate whispers to booming military commands come through loud and crystal-clear. You'll get lost in the action, instead of asking other people in the room what the characters just said! Prepare to be transported into movies and music. It is the ultimate home theater goal! The VP160 Mini is a powerful center channel in a compact cabinet! Crossed over at 80 Hz or above the VP160 Mini can keep up with large fronts and large amplification no problem. Center channels transmit the lion's share of the dialog in a movie or 5.1-channel television broadcast, and the best center channel speakers match your existing front left-and-right channel's drivers - the woofers, tweeters and midranges that make up a speaker. The VP160 Mini driver configuration is the exact replication of the M60, creating an open, spacious, seamless sound that pans across the front of your room smoothly, enveloping you in luscious sound. The VP160 Mini cabinet is flat on the bottom side and tapered back on the top. The flat bottom works perfectly if your VP160 Mini is right below or above your TV. If your VP160 Mini is going to be well below the TV you may want to choose the inverted version available in Customize Yours at no extra cost. This will angle your VP160 Mini upwards slightly pointing it at the listening position. The VP160 Mini can be shelf-mounted, placed in a cabinet, or you can place it on our dedicated center channel stand your screen. Hear everything with the VP160 Mini - audition it in your home theater with our 30-day in-home trial. Includes a five-year warranty on the standard model/ 10-year warranty on the high powered version, and free shipping! What size room does this work in? How much power does my receiver need for this speaker? Where can I put this speaker? 11.5" x 21" x 13.9"